• For oily to normal skin, it’s important to use a liquid moisturizer so not to clog the pores. • Those with dry skin should use a cream moisturizer to lock in the moisture and prevent their makeup from cracking. • Combination skin types should use a cream moisturizer that’s oil free. • Primer fills in lines and imperfections such as large pores. Thus providing a smooth canvas for applying your makeup. • Primer also holds makeup in place for long lasting wear. • Primer is also ideal for those with oily to combination skin for removing shine. • Pull all your hair away from your face, so the shape is visible. • Use an online picture diagram to identify your facial shape. • Common face shapes are heart, round, oblong, oval, square, diamond, rectangle, triangle and inverted triangle. • You should use two different foundations one should be two shades darker than your skin while the other should be two shades lighter. 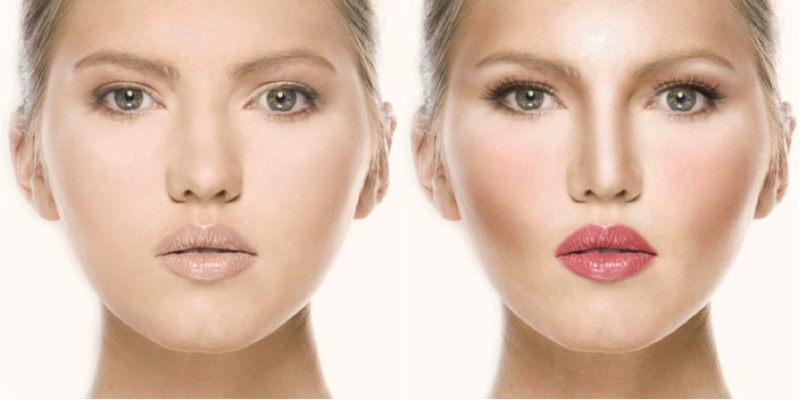 The darker shade foundation or BB cream should be applied to the shadows or hollows of your faces. • While the places these hollows are located are different on each face depending on the facial shape, they can be located by sucking in your cheeks. • Some examples of where you can locate your hallows are under the cheek and the jawline. • The lighter foundation or concealer should be applied to the places where light naturally hits your face examples of which are your T-zone, the top of your forehead, the bridge of your nose and your chin. • Square, rectangle and oblong shaped faces should contour the corners of theirs face. This gives them a smoother, more angular look and slims the face. • Diamond shapes have high cheekbones and should contour under them. • Round and oval faces should contour jawline and temples to create a more defined shape. • Inverted triangle, triangle diamond and heart-shaped faces should contour the sides of their cheeks. These balances out the rest of the face. • Concealer should be applied to under the eyes and can be used in place of the lighter foundation. • Concealer should be two shade light than your skin. • Makeup should all be the same texture i.e. powder with powder, cream with cream and liquid with liquid. • The lighter color should be moved up and out while the darker should be moved in and down. • Bronzer should be a used on tan/brown skin types. Finish with rose blush. • Pale to medium skin should forgo the bronzer and opt for light pink blush instead. • Deep to dark skin should use a warm tone finishing power and a plum blush. How to choose a dentist to deal for oral problems? HOW TO IMPROVE YOUR CREDIT SCORE TO RENT AN APARTMENT?